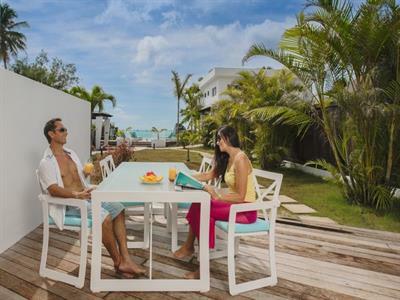 Four luxuriously spacious two-storey, two-bedroom villas includes have been built to a beautifully high standard, with contemporary fitted interiors that exude the essence of a relaxed tropical escape. Blessed with sweeping lagoon and ocean views, this gated duplex tropical hideaway wraps itself around an impressive infinity pool that flows endlessly towards the tranquil clear waters of Muri Lagoon. Our duplex villas are fully-equipped with ground floor modern kitchens and stylish living and dining areas blending seamlessly into a blissful private outdoor living space. Upstairs two sumptuous ensuite bedrooms provide a restful retreat with expansive lagoon views. Choose from our Beachfront Villas or Lagoon View Villas and indulge in our carefree Cook Island pace. Our complimentary welcome to all guests includes: fresh locally ground coffee, a starter WIFI voucher and kayak/paddleboard hire vouchers. We also offer a daily complimentary continental style breakfast which can be delivered to your door at a convenient time. •	Full sized and fully equipped designer kitchen including Bosch appliances, Family sized Fridge Freezer, Dishwasher, Blender, Microwave, gas hob + oven and Delonghi coffee machine. •	Replenished selection of tea, coffee, plunger coffee, hot chocolate, as well as eco-friendly detergents for the kitchen and laundry. •	A selection of condiments (balsamic vinegar, oil etc) for use during your stay. •	The tap water in your villa is safe to drink – filtered and also UV treated. •	You own Weber BBQ for your private use – on your balcony. •	Full laundry in each villa – Bosch washer and tumble dryer, iron and board. •	Large flat screen TV’s ( in the living area and the bedrooms)with Satellite TV ( over 20 channels including CNN, BBC, Comedy, Movies, ESPN, Crime) as well as local TV channels and also a selection of pre-programmed movies. •	Surround sound system, HDMI and includes BT or cable connection to play music from your device. •	Ipod docking station with multi use audio cable. •	Ceiling fans in every room + insect screening on louvre windows. •	Luxury Pillow top mattresses on all beds – for your comfort. •	Locally inspired bathroom amenities in each ensuite. •	Hairdryers in each ensuite as well as quality bathrobes. These absolute beachfront villas stretch out in front of the sugary white sand and glimmering water of Muri Lagoon. With private balconies on both levels, these duplex villas feature a prized master suite with uninterrupted views of the lagoon and ocean beyond. Large floor to ceiling glass doors create an illusion of floating over the lagoon as you rest in the grand Californian King bed. These two-bedroom villas feature uninterrupted picturesque views over our stunning infinity pool framed by the seductive backdrop of Muri Lagoon. Chill out on your private balcony with your own personal day bed or head out to the lagoon and explore the abundant water activities on offer. We offer 2 choices of transfers from/to Rarotonga International Airport.